INTRODUCTION: The magnification of laparoscopy allows a very precise dissection of the portal pedicles. 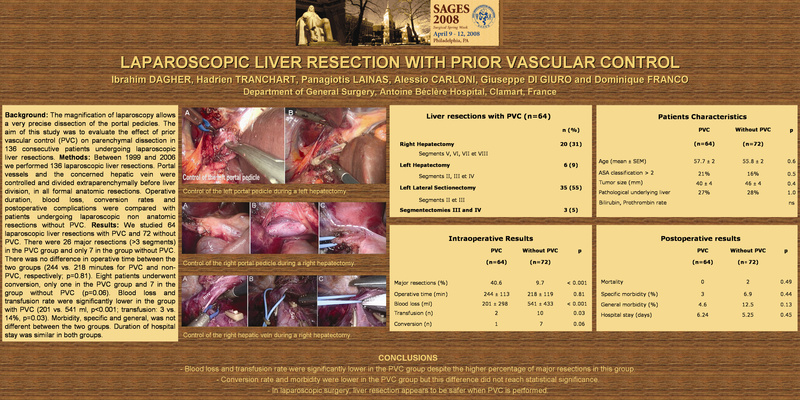 The aim of this study was to evaluate the effect of prior vascular control (PVC) on parenchymal dissection in 105 consecutive patients undergoing laparoscopic liver resections. METHODS: Between 1999 and 2006 we have performed 105 laparoscopic liver resections. Portal vessels and the hepatic vein were controlled and divided before parenchymal transection, only in formal anatomic resections. Operative duration, blood loss, conversion rates and postoperative complications were compared with patients undergoing laparoscopic non anatomic resections without PVC.